Rendering of both towers of The Modern in Fort Lee, NJ. Via SJP Properties. Overlooking the George Washington Bridge and the Hudson River, The Modern is a two-tower development designed by Elkus Manfredi Architects in Fort Lee, New Jersey. Today, SJP Properties has announced that leasing has commenced for the project’s Phase II, which has officially reached full completion. Phase II, the southern-most tower of the development, is identical to the north-facing component, which together bring 900 rentals to Fort Lee. Upon opening, the towers will have a combined 150,000 square feet of indoor and outdoor amenities, including spa and sauna facilities, state-of-the-art fitness center, gaming areas, a bowling alley, an arcade, a golf simulation room, an internet cafe, co-working areas, and a private screening room. An infinity pool, summer kitchens, a basketball court, and lawn areas are among the outdoor amenities available to occupants. At the local level, The Modern is positioned to drive a continued effort to enrich and revitalize the borough of Fort Lee. Between the two towers, SJP has also begun construction of a nearly two-acre public park offering local residents a landscaped, recreational area which the developer says will be reminiscent of Central Park. The park will also see the development of a 7,000-square-foot restaurant, with both indoor and open-air dining, in addition to a 13,000-square-foot public theater and museum. Pricing at The Modern starts at $1,717 for a studio, $2,631 for a one-bedroom, $3,604 for a two-bedroom and $6,466 for a three-bedroom residence. According to data from CTBUH, full completion of the structures positions the project as one of the tallest twin-towered developments in the world. 6 Comments on "Construction Wraps, Leasing Begins for Phase II of The Modern in Fort Lee, New Jersey"
Please pardon me for using your space: If you don’t like beautiful towers, go to see doctor and treatment. Time for a little traffic problems for Fort Lee. And why is it still named for that traitor, General Lee? You made me Google it:Fort Lee is named for General Charles Lee after George Washington and his troops had camped at Mount Constitution overlooking Burdett’s Landing, in defense of New York City. Dear Tom, the one with the room-temperature IQ, Fort Lee is named for General Charles Lee after George Washington and his troops had camped at Mount Constitution overlooking Burdett’s Landing, in defense of New York City. Please remove yourself from the gene pool immediately. 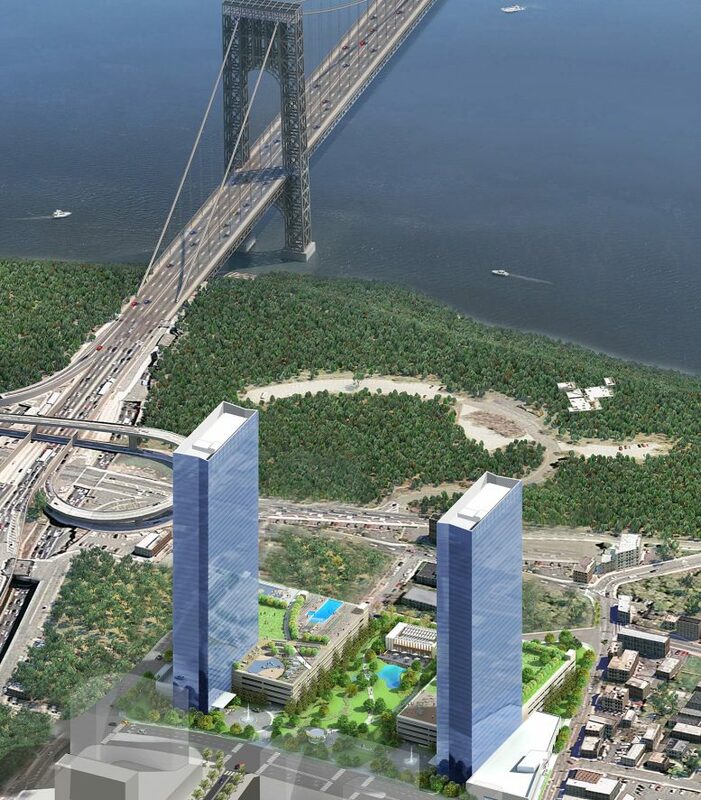 On another note, what interests me the most is the lack of traffic on the GWB in the artist’s rendering of the towers (above) – Maybe this is the future and most people use New Jersey Transit, save a few of the elite. Can i get the daily news? I see the twin buildings from across the river. At first I was annoyed about the distraction from my pristine GWB view, but I got used to it. I actually found the twin tower effect to be dramatic and not displeasing to the eye ….. until….. they just added the green light on the top floor for decoration. Why did they use such awful color and why dont the two buildings match (blue and green)? Its gaudy, distracting and actually quite ugly now!